When you look any the quality of this box set and when you look at the amazing job that Numero Group has done for their entire Unwound reissue series, it's difficult to start writing a bad review of this release. It's not that Numero Group did anything wrong, but it has a lot to do with the fact that I just don't like the Unwound records in this box set. Empire wraps up Unwound's career with their last two albums, Challenge For A Civilized Society and Leaves Turn Inside you. When Challenge came out, I really wasn't paying much attention to Unwound anymore. I can't even say for sure that I had even listened to it prior to getting this box set. I was actually excited about maybe hearing something new from a band that I had just neglected a bit towards the end. Unfortunately, this is a record that doesn't hold up. It seems like it just meanders without purpose, never really kicking in with the sort of ferocity the band had been known for. Leaves Turn Inside you, on the other hand, definitely seems to have a direction over the course of its two LPs. It just seems that the direction they chose was to make a record full of long slow songs that I don't like. I remember when this one came out and I remember coworkers listening to it when I worked in the music biz. I thought it was a boring record then and I still think it's pretty boring now. The third LP of singles, B sides and demos doesn't really inspire either. I guess since it is from the same era as the two LPs, I shouldn't really have expected it to be much different. Presentation-wise, Numero Group knocked this one out of the park just like all the prior sets. The art work is phenomenal and the booklet that they have included is just as well written and engrossing as the previous volumes. It just really comes down to a band that decided to make a few slow records that I don't like. I'm glad to have the set to round out the collection. 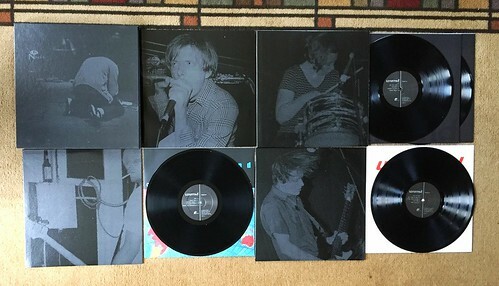 But I'm more glad to have the prior box sets so I can listen to Unwound when they still had teeth.